This century's most famous equation, Einstein's special theory of relativity, transformed our comprehension of the nature of time and matter. Today, making use of the theory in a relativistic analysis of heavy molecules, that is, computing the properties and nature of electrons, is the work of chemists intent on exploring the mysteries of minute particles. 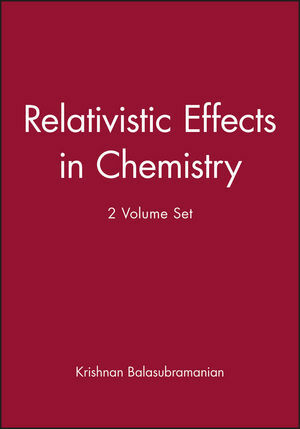 The first work of its kind, Relativistic Effects in Chemistry details the computational and analytical methods used in studying the relativistic effects in chemical bonding as well as the spectroscopic properties of molecules containing very heavy atoms. The first of two independent volumes, Part A: Theory and Techniques describes the basic techniques of relativistic quantum chemistry. Its systematic five-part format begins with a detailed exposition of Einstein's special theory of relativity, the significance of relativity in chemistry, and the nature of relativistic effects, especially with molecules containing both main group atoms and transition metal atoms. Chapter 3 discusses the fundamentals of relativistic quantum mechanics starting from the Klein-Gordon equation through such advanced constructs as the Breit-Pauli and Dirac multielectron Hamiltonian. Modern computational techniques, of importance with problems involving very heavy molecules, are outlined in Chapter 4. These include the relativistic effective core potentials, ab initio CASSCF, CI, and RCI techniques. 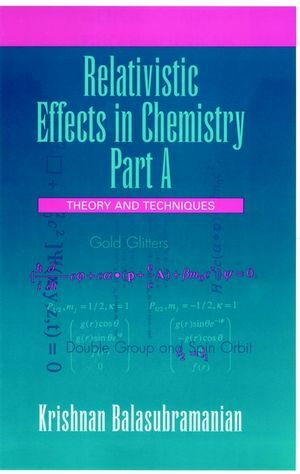 Chapter 5 describes relativistic symmetry using the double group symmetry of molecules and the classification of relativistic electronic states and is of special importance to chemists or spectroscopists interested in computing or analyzing electronic states of molecules containing very heavy atoms. An exceptional introduction to one of chemistry's foremost analytical techniques, Relativistic Effects in Chemistry is also evidence of the still unending reverberations of Einstein's revolutionary theory. KRISHNAN BALASUBRAMANIAN is Professor of Chemistry at Arizona State University. He has received the Alfred P. Sloan Fellowship, Camille and Henry Dreyfus teacher-scholar and Fulbright Research awards. He is an author of about 400 journal publications. Double-Group Symmetry and the Classification of Relativistic Electronic States.